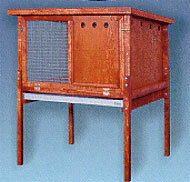 Rabbitat Hutch Deluxe by Ware Mfg. The Rabbitat Deluxe the ultimate in Hutches, all the bells and whistles. * Easy to assemble with basic tools. * Fold down front entry. * Removable front weather shield.